Heat oven to 400°F. In 9-inch glass pie plate, melt butter in oven; brush butter over bottom and side of pie plate. In medium bowl, beat eggs slightly with wire whisk or hand beater. Beat in flour, milk and salt just until mixed (do not overbeat). Pour into pie plate. Bake 25 to 30 minutes or until puffy and deep golden brown. 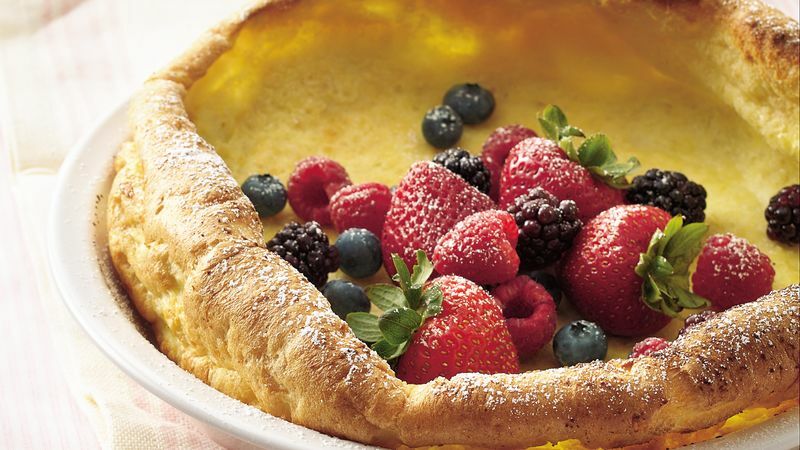 Serve pancake immediately topped with berries. Sprinkle with powdered sugar. You can use your favorite fruit. Sliced peaches or a mixture of berries and peaches makes a tasty combo.